Woodys Copy Cat (#10), under jockey Manuel Gutierrez, gets up over Hs Paul Walker, in the $315,350 New Mexico Classic QH Futurity(RG2) Sunday at Zia Park. HOBBS, NM—NOVEMBER 4, 2018—Woodys Copy Cat, a $4,700 New Mexico Bred Yearling Sale Graduate, defeated Hs Paul Walker by a neck Sunday in the $315,530 New Mexico Classic Cup QH Futurity(RG2) at Zia Park. Wood Be A Superstar finished half-a-length back in third. Ridden by jockey Manuel Gutierrez, Woodys Copy Cat broke second but drove to victory while completing the 400 yards in :19.687 seconds, a 94 speed index into a 15 mph headwind. The $151,416 winners' purse boosted the Woodbridge filly's earnings mark to $240,720. Trainer Cynthia Gonzalez conditions the brown filly for owner Enrique Barrera. Bred by MJ Farms, from the Heza Fast Man mare Fast Copy Miss, Woodys Copy Cat has compiled a (7) 3-2-1 record, was also second in the New Mexican Spring Futurity(RG2) in April and a finalist in the Four Corners Futurity. Hs Paul Walker, a $6,000 repurchase in the New Mexico Bred Yearling Sale, earned $50,462 for owner Fernando Solis Grajeda. Jesus Carrete saddled the gelding by second-crop sire Osbaldo from the Strawflyin Buds mare Strawberryberryfast. 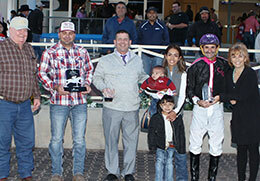 Jockey Alonso Rivera rode the Hubaldo Solis New Mexico-bred earner of $93,960. 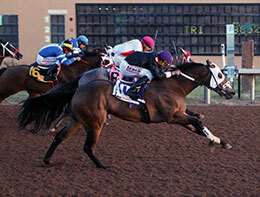 He was also a finalist in the New Mexican Spring Futurity in April. Wood Be A Superstar, another MJ Farms' bred Woodbridge 2-year-old, doubled his earnings to $48,269 after picking up $26,024 for third. All American Futurity(G1) winning trainer G. Blane Wood trains the sorrel gelding for owner Aldai Transport. Second in the By By JJ Stakes at Ruidoso last summer, Wood Be A Superstar has compiled a (7) 2-2-2 record. He is out of the Tres Seis mare Starsmith. Champion jockey Ricky Ramirez was riding. Posttime favorite Zee James was forced in late and finished fourth, followed by Flo Jos Mojo, Tooflashforyou, U Got The Look, Saul, Easy Over The Moon and Igotmybiggirljeanson.